HG Alternative: If made with an equal amount of Splenda No Calorie Sweetener (granulated) in place of the granulated white sugar, each muffin will have 146 calories, 25.5g carbs, and 5.5g sugars (PointsPlus® value 4*). Preheat oven to 350 degrees. Line a 12-cup muffin pan with foil baking cups, or spray it with nonstick spray. Combine streusel ingredients in a medium bowl. Mix and mash until uniform and crumbly. To make the muffins, in a large bowl, combine both types of flour, baking powder, baking soda, and salt. 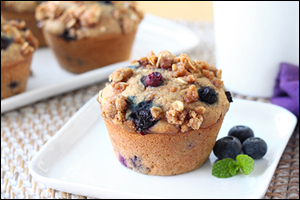 In a medium-large bowl, combine all remaining muffin ingredients except blueberries. Whisk until uniform. (Don't worry if the butter doesn't break up completely.) Add mixture to the large bowl, and stir until just mixed and smooth. (Batter will be thick.) Fold in blueberries. Evenly distribute batter among the cups of the muffin pan (cups will be very full), and smooth out the surfaces. Sprinkle with streusel. Bake until a toothpick inserted into the center of a muffin comes out clean, 22 - 24 minutes.